It is a little side note to history that the ': father never worked a day in his life. When asked about this Baron Sr. invariably replied, with a contemptuous snort: "Work is for the working stiffs." The Baron's mother, it is said, accepted this situation with a philosophic shrug, saying: "Work makes him break out!" 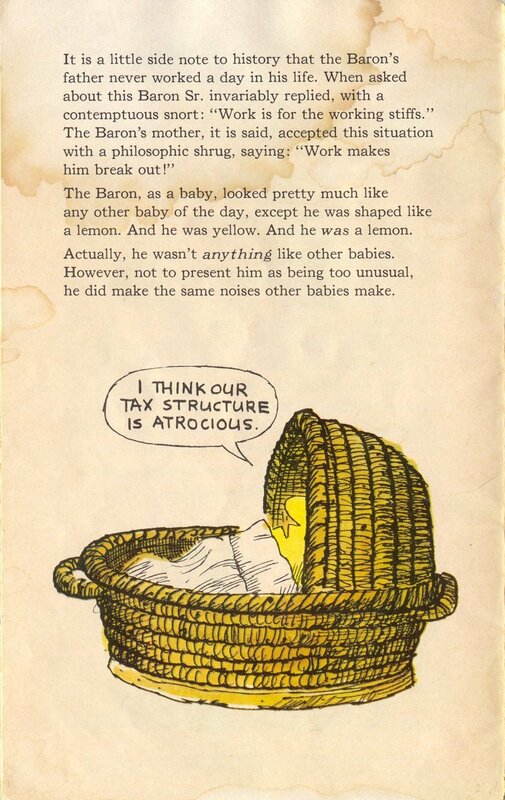 The Baron, as a baby, looked pretty much like any other baby of the day, except he was shaped like a lemon. And he was yellow. And he was a lemon. Actually, he wasn't anything like other babies. However, not to present him as being too unusual, he did make the same noises other babies make.